● Standard Subaru Symmetrical All-Wheel Drive and X-Mode offer the optimal blend of drivability and SUV capability. Tokyo, November 29, 2017 – Subaru Corporation debuted the all-new Ascent, exclusively developed for the North American market, in Los Angeles on November 28 local time. To pursue further growth in North America, Subaru has developed the Ascent. Designed for active families on-the-go, both exterior and interior builds on Subaru’s “Dynamic x Solid” design philosophy to create an SUV with commanding presence, while emphasizing the functionality critical as 3-row midsize SUV. The Ascent, with the largest body size in the Subaru line-up comes in seven- or eight- passenger configurations, both with ample interior space. To ensure fun for the whole family, the model offers upgraded conveniences as well as superior ride quality achieved by the Subaru Global Platform. Thanks to the new platform, increased body rigidity suppresses vibration and noise, for enhanced driving comfort. In addition, the Ascent allows the pleasures of family travel anywhere with peace of mind by employing the Subaru core technologies such as standard EyeSight Driver Assist Technology, Symmetrical All-Wheel Drive powered by an all-new 2.4-liter Boxer direct fuel injection turbo engine and X-Mode which enhances SUV capability. The all-new Ascent will be built at Subaru’s US plant, Subaru of Indiana Automotive, Inc. and delivered to Subaru retailers in early summer 2018. To meet the needs of young families that require both comfort and ease of use, Subaru has created an interior space allowing a comfortable experience in all seats, including seats in the third row. ・ The Ascent offers enough room between passengers appropriate for comfort in a midsize SUV as well as ample cargo space. ・ Enough rear door opening angle and wide rear door openings allow easy access for both second and third row passengers. Steps and grips are also positioned for ease of ingress and egress. ・ The third-row seat achieves a comfortable sitting posture. ・ For the first time in a Subaru model, the Ascent adopts a new type of power rear gate with a built-in drive unit that contributes to achieve enough cargo space. ・ The driver’s seat features a cushion-length adjustment for the first time in a Subaru model. ・ The seven-passenger configuration uses two captain seats in the second row for the first time in a Subaru model. Enough space between these seats allows easy access to the third row. ・ A three-passenger second-row bench seat is standard in the eight-passenger configuration. ・ Seat-recliners and other features allow both adults and children to sit comfortably; the Ascent offers third-row seats that make traveling fun. 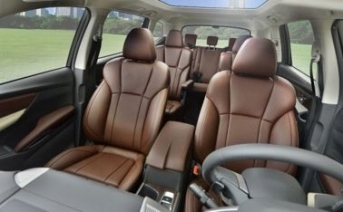 Many interior features enhance convenience and comfort as a 3-row SUV which offers fun for whole families. ・ In addition to an infotainment system for smartphone connectivity, the Ascent is equipped with a cabin-view mirror, a panoramic sunroof, sunshades, a fully automatic air conditioning system with left and right front-seat vents and independent rear-seat controls, and ventilated seats—these for the first time in a Subaru model. ・ Rich in conveniences such as USB ports for smartphone charging and left- and right-side cup holders that also accommodate tablets. ・ Dedicated third-row air conditioning vents ensure comfort in the third-row seat area. To create an SUV with a commanding presence and functionality, the Ascent’s exterior and interior build on Subaru’s “Dynamic x Solid” design philosophy. ・ Dynamic and sturdy SUV styling with a functional shape required for 3-row midsize SUV has been expressed. ・ Tough look befitting of an SUV as well as rich and roomy cabin have been expressed by creating the central instrument panel with dynamic and spacious feel. 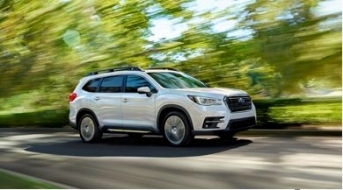 Symmetrical AWD with the newly developed 2.4-liter turbocharged direct-injection Boxer engine at its core; X-MODE—for enhanced rough road performance; and the Subaru Global Platform, ensure SUV capability with a peace of mind and an enjoyable driving experience for both drivers and families. ・ Despite its smaller displacement, the newly developed 2.4-liter turbocharged direct-injection boxer engine achieves smooth acceleration equal to or better than that of competing vehicles with 3.5-liter 6-cylinder engines. ・ The Subaru Global Platform improves body rigidity, enhancing dynamic quality feel such as smoothness and exhilaration. ・ The Ascent achieves both excellent straight-running stability at high speeds and good handling at low speeds. ・ Active Torque Vectoring allows superior turning performance and hazard avoidance capabilities. ・ Paddle shifters allow drivers to choose the feel of a manual transmission. ・ Subaru’s distinctive Symmetrical All-Wheel Drive system offers stability in various circumstances, including challenging road conditions caused by snow, rain, or mud, and on the highway. ・ X-MODE improves performance on slippery and other difficult road surfaces through integrated optimal control of the engine, transmission, and braking. Its Hill Descent Control setting gives drivers greater peace of mind by maintaining low speeds on downhill slopes. ・ Along with the 8.7 inches of ground clearance appropriate for an SUV, the Ascent ensures enough road clearance such as approach and departure angles when encountering a slope or returning to flat terrain from a slope, as well as ramp breakover angle at the peak of a rise, that broaden the range of activities families can enjoy. ・ A maximum towing capacity of 5,000 pounds, the most of any Subaru in history, allows towing of a camper or boat, supporting an active family lifestyle. Subaru’s core technologies such as Subaru Global Platform and all-new 2.4-liter Boxer direct injection turbo engine offers greater comfort for all the drivers and passengers, achieving drivability in long distance without stress. ・ The Subaru Global Platform contributes improved body rigidity, resulting in better ride comfort for all, including third-row passengers; the Ascent interior is a comfortable, quiet, low-vibration mobile environment. ・ Two driving modes, automatically selected based on accelerator pressure, make driving both pleasurable and secure. Automatic step-shift control provides sporty acceleration, while stepless shifting allows for a smoother driving style. ・ Automatic Vehicle Hold keeps the vehicle from moving when stopped, even if the driver releases the brake pedal, greatly reducing fatigue during traffic jams, waiting at signals, or when stopped on a slope. ・ The newly developed 2.4-liter, horizontally opposed, turbocharged direct-injection engine and Subaru’s high-torque Lineartronic continuously variable transmission teamed with enough fuel tank capacity achieve class-leading cruising range while developing engine output and towing performance approaching those of a 6-cylinder vehicle. Designed to be a car the entire family can enjoy with peace of mind: Embodying this principle, the Ascent is designed to be safe and enjoyable not only in emergencies but in any driving situation. 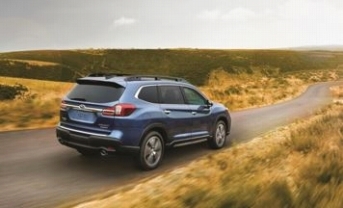 Reflecting Subaru’s comprehensive concept of safety, the Ascent achieves top-of-class safety performance. ・ Although the Ascent is large, Subaru has reduced blind spots, achieving excellent visibility by optimizing pillar design and installing a variety of cameras and monitors. ・ A new front-view monitor reduces driver blind spots, contributing to prevention of front-end collisions. ・ A smart rear-view mirror linked to an interior camera mounted at the upper side of the rear gate window improves rear visibility. ・ The Ascent offers excellent braking performance. In addition, the Subaru Global Platform designed to avoid dangerous situations makes the Ascent a leader in its class in active safety performance. ・ Subaru’s unique EyeSight driver assist technology and the EyeSight Assist Monitor are standard equipment on all models. ・ Reverse Automatic Braking reduces or entirely avoids collisions while backing. ・ Side/Rear Vehicle Detection System detects vehicles approaching from behind. ・ Steering-responsive headlights secure a clear nighttime view. ・ High Beam Assist improves visibility when driving at night. ・ By employing the Subaru Global Platform, excellent occupant protection, even for third-row passengers has been achieved. ・ All configurations are equipped with driver and front passenger SRS airbags, driver-side SRS knee airbags, and SRS side and side curtain airbags—a total of seven airbags as standard equipment—for class-leading occupant protection.